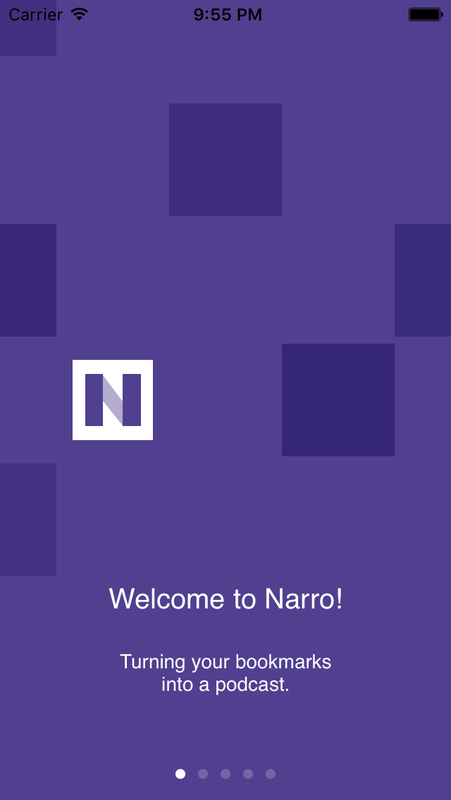 TL;DR: Listen to your reading list as a podcast on Narro. Free online, in Chrome, in Google Play, and in the App Store; $2/hour of audio generated. Pretty much the best thing to happen to your morning commute. 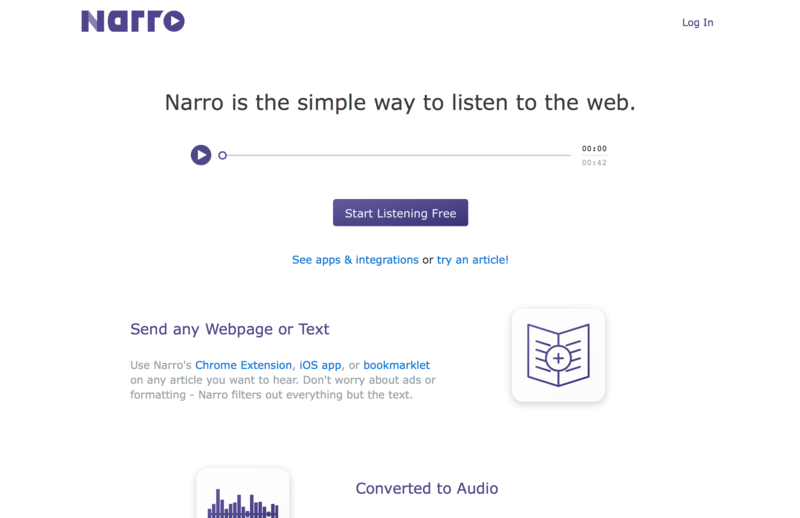 Narro turns your bookmarks and your endless reading list into a personal podcast. You can listen to that podcast on any device, in (almost) any podcast player, and you can share it with anyone else. 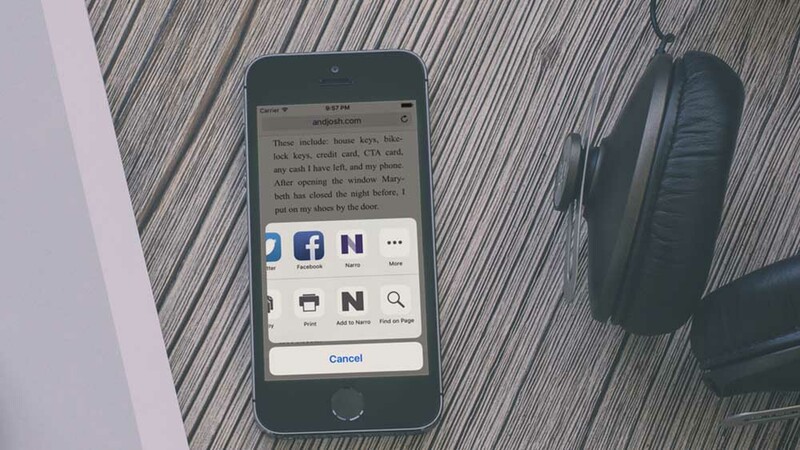 You can send articles, arbitrary web pages, and even plain text to Narro from your iOS devices, desktop web-browser, or other integrations (like Pocket, Instapaper, email, IFTTT!). 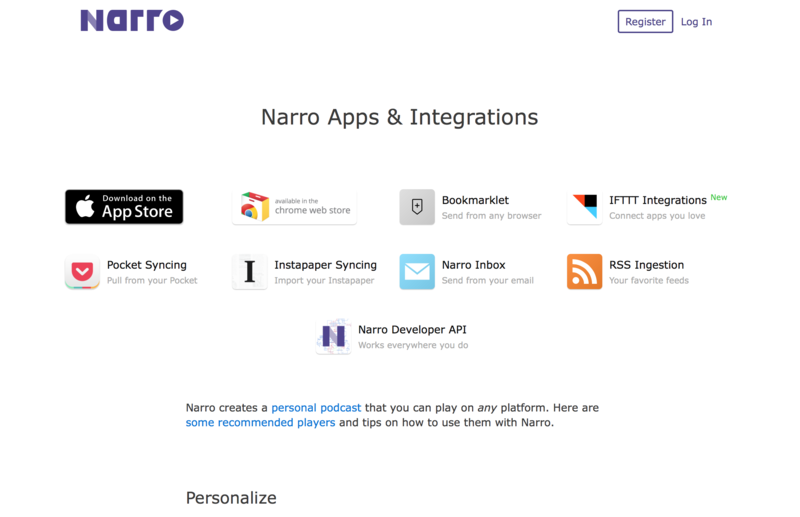 Listening to your personal Narro podcast is so easy, many users listen for hours on end. Narro is press-friendly, too! 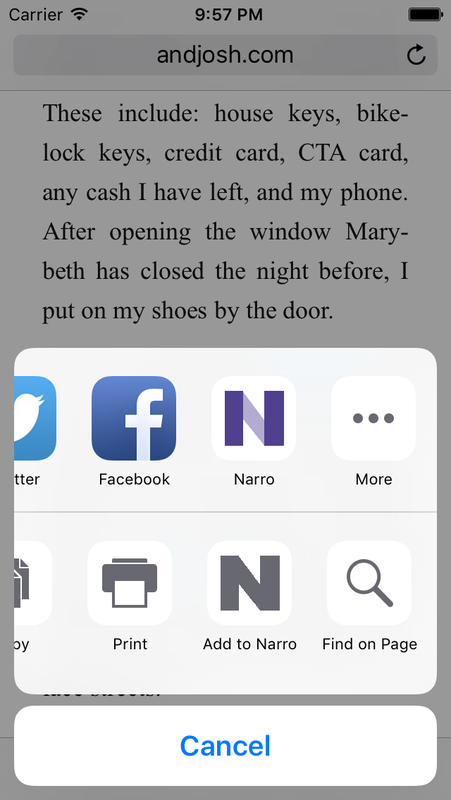 Every Narro download or free account starts with at least one reading, and you can always add more. With dozens of voices to choose from, Narro also automatically detects several languages and reads in the native tongue of your articles. Your personal podcast is available anywhere. 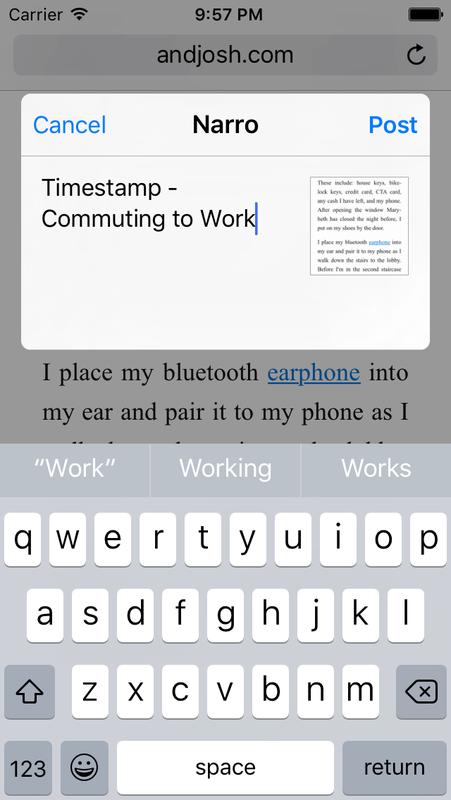 Submit articles on any device, integrate with all your favorite reading apps. 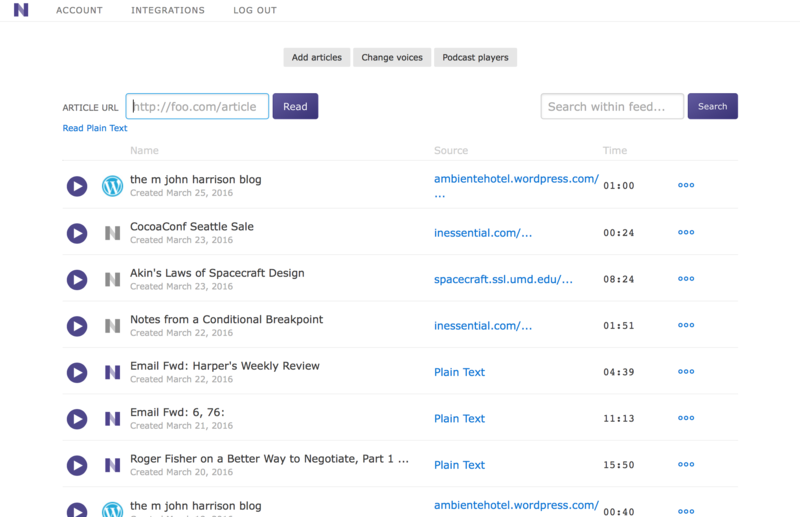 Links are extracted from each article, so you never miss context. Search an archive of all your articles. Every reading is private by default, but shareable anywhere. Unobtrusive: Narro set up takes ten seconds and then works continuously. Want to listen to a non-article? Narro supports plain-text, PDF, and EPUB/ebook submissions too! Narro is available online and directly from the App Store worldwide and is free to use for 15 articles each month. Upgrading to Narro Pro yields unlimited articles and a host of other features for $2/hour of audio generated. Josh Beckman. He's a developer and avid listener living in downtown Chicago. You can reach him at [email protected] or via chat. I have listened to 26 articles on @NarroApp and I feel amazing! Mijn @Tech45cast tip is @narroapp! Handig om text van websites / RSS feeds / instapaper / pocket als een podcast te beluisteren. You can find @NarroApp on Twitter, on Facebook, and promoting open-source software as an organization on GitHub.